When it comes to a "real winter," I'm as newbie as you can get. A wide-eyed freshman on the first day of high school, if you will. As some of you may know - I'm heading to Oxford in January for a quarter abroad. I'm pretty apprehensive about the gray-skies-for-days and thrill of the chill dealio. I mean, I walked two minutes over to the dining hall last night and thought I was traipsing through an igloo, I was so cold. My sister is taking me shopping this weekend for some "winter essentials." Honestly, I don't even know what those are. Mittens? Snow shoes? Long underwear? I'm a little lost here, guys. Anyway, here's what I'd like to get - they're probably not in the least bit practical, but I'm past that and instead thinking about how darn cute they'll all look in my Instagram pictures in front of Big Ben and next to Kate Middleton because I'm sure I'll meet her at her favorite Zara, and casually sipping tea with my pinky up. 1. Basic black with some rockin' metal. That low pricetag would be ideal for some guilt-less adventuring in all the wind and rain. 2. I don't need it, I don't need it, I don't need it. But I just want them so badly. 3. Nothing makes me happier than toasty toes! 4. I'm thinking that motorcycle length boots might be a chic, edgy alternative to my go-to riding boots! 5. Debated with myself over whether I'd rather have Ugg boots or moccasins and needless to say, moc's won. I had these in camel for a few years, and they are ridiculously cozy. And they'd be nice for a day I'm not feeling particularly bootylicious! 1. I've wanted a quilted J.Crew vest since seeing them all over my Pinterest feed last fall. Definitely a stylish way to keep warm, especially in a fun pattern like this striped one or my (sold out) favorite - the herringbone. And the solid hunter green's not too shabby either! 3. I wanted a good, chunky, cable-knit infinity scarf. But then my friend threw hers in her "to give away" pile, and I snatched it right up, so I'm good on that front now. I never knew I wanted a newsprint scarf until I saw it just now on Etsy, and I've suddenly realized I can't live without one. It's just so wildly hip and cool for a wildly un-hip, un-cool girl like me! 4. I tried (and bought) some fleece-lined leggings for myself this weekend - GAME. CHANGER. It's how I imagine it'd feel like to have a baby panda hug your legs and never let go. 5. I've never really had to shop for sweaters before, but only now am I realizing what I've been missing out on! So many cute options! Don't worry, Sarah. You're not going broke this weekend; I'll tone it down. such cute pieces/ shoes... 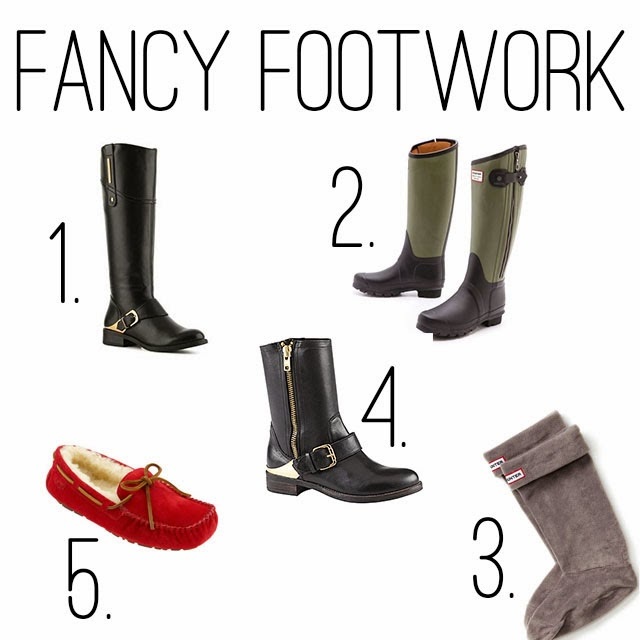 I'm swooning over boot #1 and 4! soooo flippin cute! Fleece lined leggings = divine. straight up the best thing I've ever bought for winter. My booty is so happy. I'm hoping to go back to England for my semester abroad. Wouldn't that be amazing if you run into the Duchess of Cambridge? I feel like meeting a royal could be potentially awkward because is it really appropriate to take a selfie with the future queen of England? Can't wait for your pictures once you get to London!! Definitely invest in layers, for sure! Hi Caroline, I just discovered your blog! It is super cute. I actually grew up in the Palo Alto area, so I'm very familiar with Stanford. Lots of my friends' parents were professors there, haha! Going to Oxford for a quarter sounds like a blast! I know I would sure feel the need to get some cute clothes for the trip. Pff the weather is mild now compared to how cold it can get!! Invest in some Uniqlo heattech to wear underneath all the cute outfits.. you'll need it! such a lovely post! i love winter dressing - you have so many more options! oxford will be reeeeally cold in january, apparently we're heading for the worst winter in decades in the UK :'( definitely bring lots of layers and snuggly pyjamas! Haha yes you will need some good boots definitely! Maybe some wellies too. Good choices though, look like they will keep you warm, you just need to layer up! And never go anywhere without a scarf. Oh WOW I didn't know this! Lucky you, I always wanted to live in London for year or two or do the study abroad thing. So excited for you! Can't for you London based posts aahh!! great finds.. cold weather clothes are fun lots of great layering possibilities and the experience will be one you'll love. It's a bitter freeze your fingers off cold is what I dread.. I need all these finds! Ah, Oxford! Exciting. Since you will be there during the winter my tip for you is layers! It gets pretty cold in Europe during the winter, not California cold... But I think with the right boots (versatile rain boots, or any thick water proof material and grip underneath), and a winter coat you will take Oxford by storm! Anyway, I'm sure your sister has got you covered! Enjoy!